I want to stress this point: the essence of Stalinism is the reforging of souls. 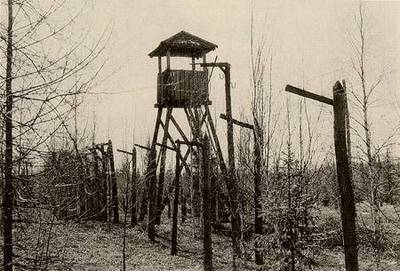 … The point was not to correct the five or fifteen million in [the corrective camps] because they were a minority and Stalin was concerned with large numbers, large percentages; the only point was the population as a whole. … The point was for everyone to feel that threat at every moment, to know that the camps were terrible and that this could not be spoken of because this was something holy, sacral. A prisoner is considered to have been sufficiently prepared for the final achievement of the signature only when his personality has been thoroughly dismantled into its component parts. Gaps appear in the logical association of ideas; thoughts and emotions become loosened in their original positions and rattle against each other like the parts of a broken down machine; the driving belts connecting the past with the present slip off their wheels and fall sloppily to the bottom of the mind; all the weights and levers of mind and willpower become jammed and refuse to function; the indicators of the pressure gauges jump as if possessed from zero to maximum and back again. … the next morning he wakes feeling empty as a nut without a kernel and weak after the inhuman strain to which his whole organism has been subjected during the past few months, but dazzled by the thought that everything is already behind him. When a prisoner walks between the bunks without saying a word to anyone, it is easy for the others to guess that he is a convalescent with rapidly healing scars and a newly-assembled personality, taking his first uncertain steps in a new world. Because we also are broken, conquered: even if we know how to adapt ourselves, even if we have finally learnt how to find our food and to resist the fatigue and cold, even if we return home. We lifted the menaschka on to the bunk and divided it, we satisfied the daily ragings of hunger, and now we are oppressed by shame. Here and there, more suspect plumes of smoke mingled with more benign vapors, while a familiar-sounding clatter drifted up faintly my way from somewhere, like bells in dreams, and as I gazed down across the scene I caught sight of a procession of bearers, poles on shoulders, groaning under the weight of steaming cauldrons, and from far off I recognized, there should be no doubting it, a whiff of turnip soup in the acrid air. A pity, because it must have been that spectacle, that aroma, which cut through my numbness to trigger an emotion, the growing waves of which were able to squeeze, even from my dried-out eyes, a few warmer drops amid the dankness that was soaking my face. Despite all deliberation, sense, insight, and sober reason, I could not fail to recognize within myself the furtive and yet—ashamed as it might be, so to say, of its irrationality—increasingly insistent voice of some muffled craving of sorts: I would like to live a little bit longer in this beautiful concentration camp. The implication of that sentence “I would like to live a little bit longer in this beautiful concentration camp” and the tortuous way that the sentence is finally squeezed out of the barely comprehensible experience that elicited it, is the very essence of the literature of the civilization behind wire. I can’t blame anyone for not wanting to think that sentence through, to ponder how it could have been uttered and what it means that it was. But, there we are. The civilization behind wire did exist and it has left to us a legacy. I very much wish this weren’t the case. But it is. Could France’s new odd couple—Sarkozy and Kouchner—spell the end of French privilege for Africa’s most venal?